This week’s episode of the Live at Lakeview Backstage Pass explores the diverse history of entertainment that’s been hosted at Lakeview Commons. Tune in to discover how many bands, cities and countries have been represented on the Live at Lakeview stage over the past 5 seasons. Our 100 day countdown is on! 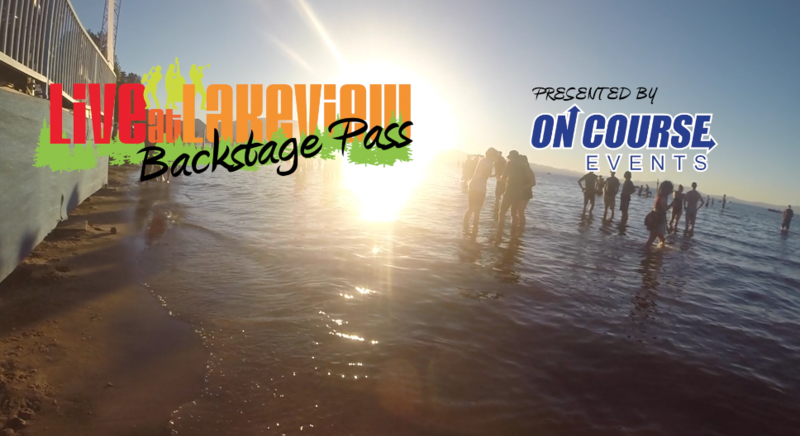 The Live at Lakeview Backstage Pass is your ticket to get involved with the process + all the hard work that goes into your favorite summer music series! If there’s an aspect of the concerts you want to know more about (how we find our entertainment, how the series is funded or where in the world we plan to put the stage this year?!?!) Now’s your chance to ask our team + your question may be featured on the next episode! Stay tuned on Facebook, Instagram + YouTube to have the inside scoop at your fingertips! Want to Perform on the Live at Lakeview Stage?! Apply Now! 2016 Live at Lakeview Summer Music Series returns for its’ 6th season of FREE live music every Thursday night, starting June 22, 2017. Band applications now being accepted. Apply now! 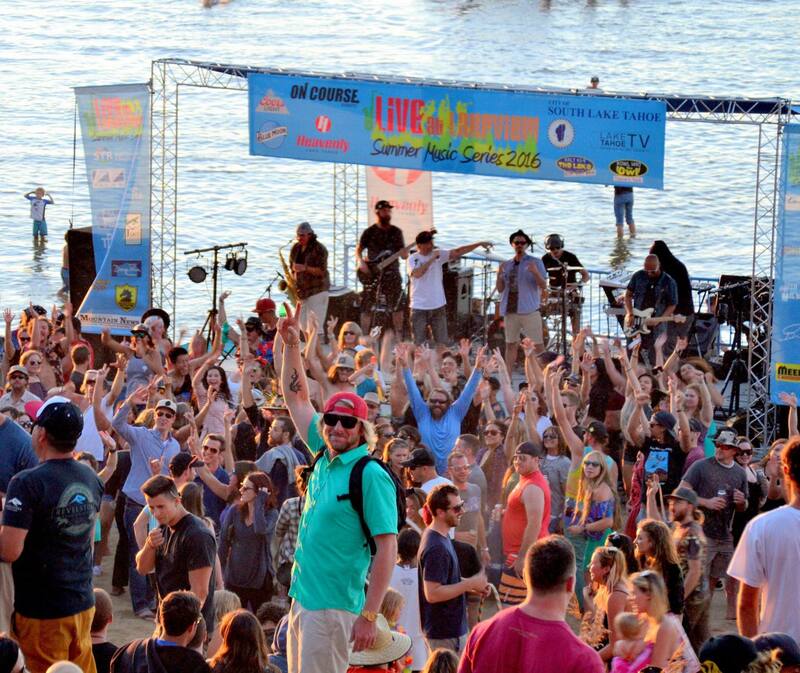 Live at Lakeview is wrapping up the 2015 summer with its most bodacious Tahoe party this summer. Tahoe legends Lavish Green and recent local favorites Black Star Safari are playing rocking farewell sets on the shore to celebrate the last shows of the summer. The City of South Lake Tahoe is also celebrating its 50th Anniversary Birthday with a group photo of the whole beach with everyone invited to join. It is going to be one hell of a party. Over the past two years, Black Star Safari has grown to be one of Tahoe’s favorite live acts for its deep-set grooves and tenacious rhythms. Dan Green’s guitar and Matt Mandella’s drums have found a harmonious interplay together that pumps back-and-forth like pistons on a steam engine. In the spring the duo released their second EP, “All In.” Green and Mandella self-produced the five-song EP and recorded it in their home in the heart of Meyers. The band had worked out the songs live for some time and the vice grip tightness of the compositions speak to the blood and sweat that has been spilt on stage over the past couple years from the pair. The night ends with a finale set from Lavish Green. The band was formed 20-years ago this summer amidst the mountains and water and return for another special night at Live at Lakeview. Three of the original members remain, Chris Sanchez, Robbie Wheeler and Joel Gruneich, with the newly minted Mike Bennett on drums. They still throw heart and passion behind their ska/reggae/rock combination and love doing it in front of a crowd. 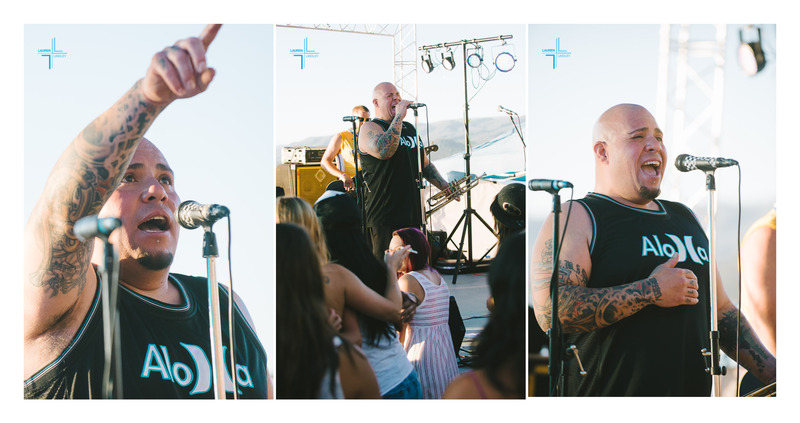 Tahoe has been their home and they love returning to its open arms, especially for such dedicated fans as Live at Lakeview’s. Live at Lakeview has been a cherished part of the summers in South Lake Tahoe for the past four years. It brings the community together to celebrate music, food, beer, local businesses and taking a break to enjoy the beautiful place everyone calls home. The best part about Live at Lakeview is that this weekly party is put on for free every week, so everyone has a ticket to attend. But while the event is free, putting it on certainly is not. From four to six months of planning with bands, renewing contracts with vendors and supporters, to the day-of hassles of putting on an event, Live at Lakeview is a colossal undertaking that requires a lot of time, money, hard work and support from the community to organize and execute. We want to open the hood of Live at Lakeview and share how the community comes together to create such a spectacular event that has elevated from a whimsical vision to a centerpiece of summer. 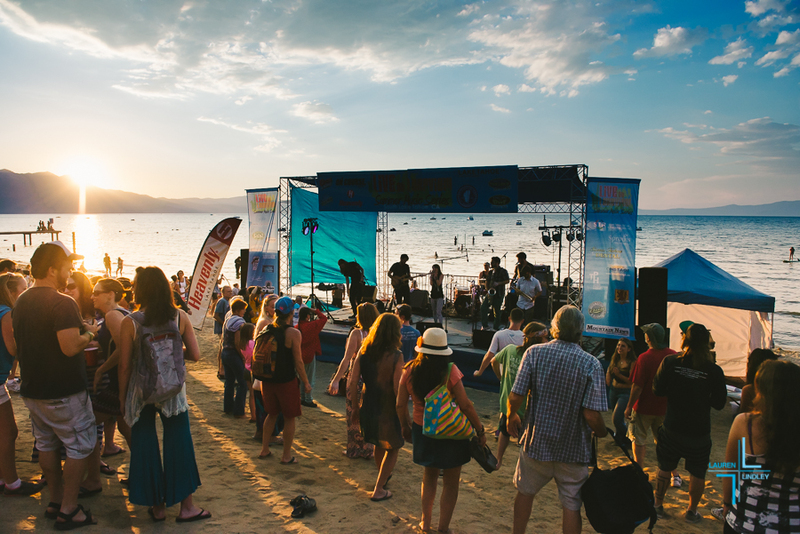 Live at Lakeview started four years ago when Rob Giustina suggested to the City of South Lake Tahoe about having a concert series at the newly renovated park at El Dorado Beach. With a goal of putting on weekly, family-friendly concerts the community could enjoy, Giustina rustled up a dozen local sponsors to help organize and fund the event. His vision has come along way and Live at Lakeview has been going for four strong years and has been given an additional five-year contract with the city. And the City of South Lake Tahoe has been the primary sponsor and host of Live at Lakeview since its inception. 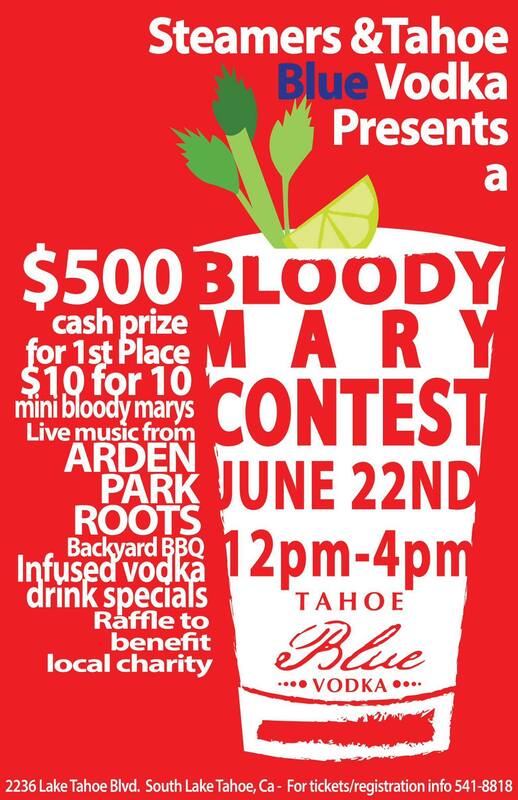 In addition to providing monetary donations, the city also provides the event with a free venue to hold the festivities, helps coordinate with Cal Trans for road closures, procures the South Lake Tahoe Police Department to provide support and helps promote the event. Live at Lakeview wouldn’t be a possibility without the gracious support of the City of South Lake Tahoe. The event would also never be a reality without the contributions of over 30 local sponsors, who all squeeze together on the colorful Live at Lakeview banners like friendly neighbors. The sponsors are willing to help out however they can, whether it be from a monetary donation to offering their services, like Sprouts Cafe feeding all the bands that appear at Live at Lakeview. With so many people and organizations from the community helping to put on Live at Lakeview during the summer, Live at Lakeview finds it important to make sure to give back to the loving community. In addition to providing an awesome way to spend a Thursday on the beach, Live at Lakeview donates a percentage of its beer garden sales to benefit the South Tahoe BMX Association. This organization is working closely to help build the Bijou Bike Park and they are saving up for a new starting gate at the current track. These donations are bringing them closer to their goal every week! Essentially, every beer you drink goes right back into helping the community. Live at Lakeview is an event that is given life by the community and it is the hope of Live at Lakeview it injects a little life into everyone that attends. Nothing but those sweet summer blues on tap for the first Thursday of summer in South Lake Tahoe! Blue skies, Blue Moon brews + authentic blues vibes from The Raymond Victor Band! The Jonny Gold Trio will start off today’s show at 4:30 pm with their unique jazz tunes from the great American songbook with songs by artists such as Duke Ellington, Miles Davis & Antonio Carlos Jobim. 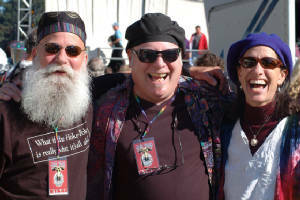 This jazz trio from Davis, CA is known for their jazz standards, ballads, latin jazz and blues. One of the band members will be joining us again this summer when his funk band, Big Sticky Mess, opens up for the Polyrhthmics on August 13th. Our headliner, The Raymond Victor Band, will take the stage at 6:00 pm and we cannot wait to see what he has in store for us! 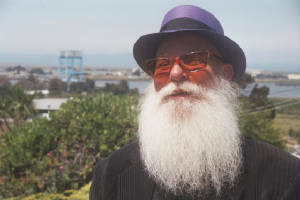 This blues brother grew up in Chicago during the peak of the blues in the 1950’s and 60’s. We found this gem of a band thanks to a family connection with their manager, who also happens to manage Janis Joplin’s original band, Big Brother and the Holding Company! While the actual set list remains a mystery, there is no doubt we are in for a musical treat! Victor spent many years working along side some big legends in the blues and jazz world. He’s recorded with legends including Stevie Wonder, Bobby Womack, Larry Graham and Sly Stone… just to name a few! PLUS he’s shared the stage with Buddy Miles, Garth Brooks, Lou Rawls and many others. Cheers to the first Thursday of summer! See you at the beach! 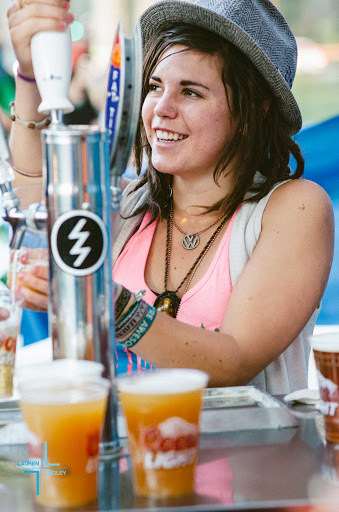 This summer, being charitable is as easy as ordering a cold one at your favorite outdoor concert series! That’s right, when Live at Lakeview returns to the beach this Thursday and you order that first ice cold beer of summer, you’re not only supporting the series you’ve all grown to love, you’re also supporting a great local non-profit organization. It’s simple. We know you love beer/wine (we do too), we know you care about this community (we do too!) and the best part is, you can have it all!! On Course Events has chosen the South Tahoe BMX Association as this season’s beer/wine garden beneficiary. If you have a kid, or know of one, that rides at the local bmx track – your beer supports his future races! If you want to see the exciting new Bijou Bike Park project come to life – your next glass of wine proceeds help to make that dream reality. 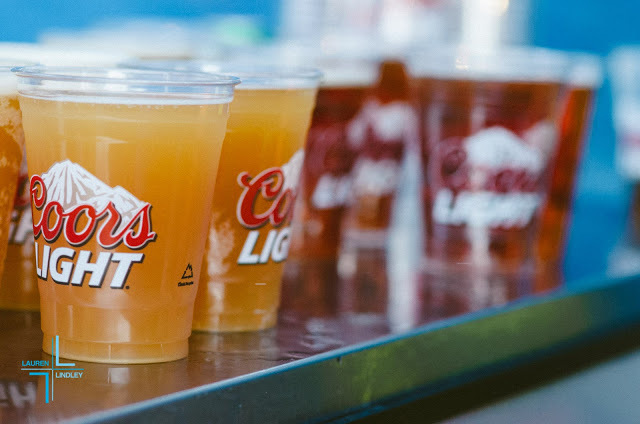 So as you sip on those cold beers, feel good about yourself for the charitable donations you’ve made and give cheers to Coors & Blue Moon for making it all possible! Cheers to a beautiful summer ahead! While the rest of California overheats, we’re chillin’ here in South Lake Tahoe! With plenty of summer fun left ahead of us, plan your next summer getaway in South Lake Tahoe – but before you do, check out some pro tips from our friends at Submerge Magazine. 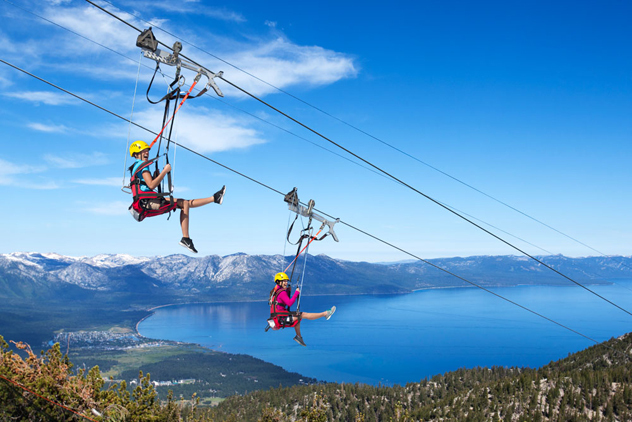 While you’re here be sure to check out the great activities our event partners offer, from Standup Paddle Boarding with South Tahoe Standup Paddle Board to flying through the sky at Heavenly Mountain‘s brand new Blue Streak Zip- Line. 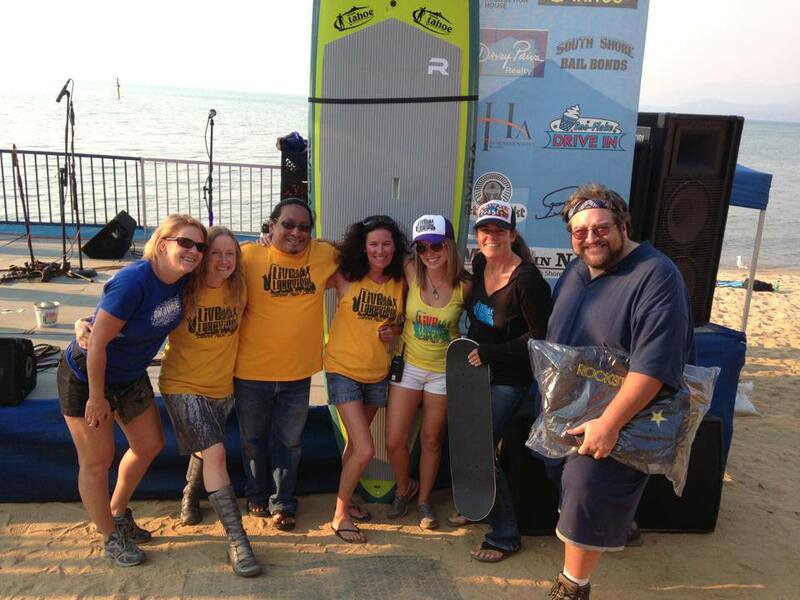 Check out all of Submerge’s pro-tips and join us up in Lake Tahoe to beat the heat this summer! The First Week of Summer in South Lake Tahoe! 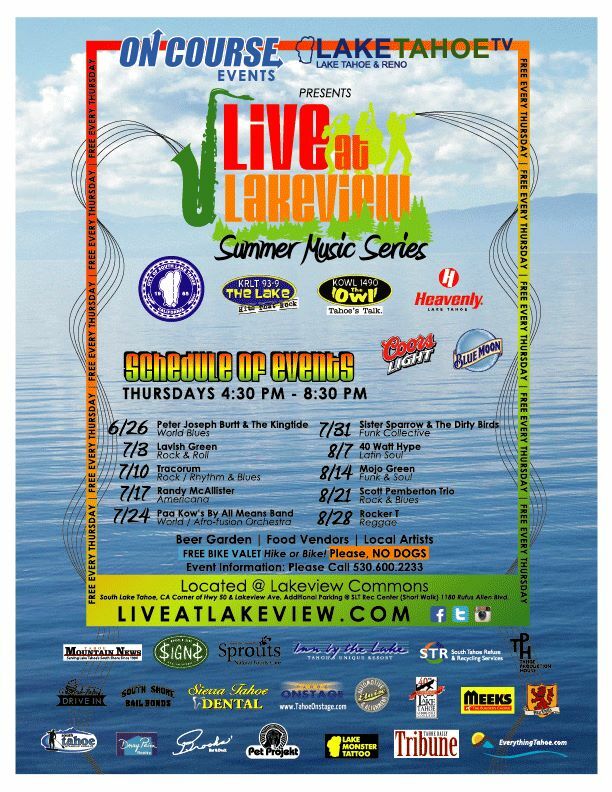 There’s a lot of anticipation building here in South Lake Tahoe as we get closer to the debut of the third season of the Live at Lakeview Summer Music Series! The first concert of the summer is next Thursday, June 26th! If you’re looking for ways to help the time pass a little faster (and have a ton of fun in the meantime) we’ve got your back! There’s a ton of super fun things to do in Lake Tahoe to enjoy the first week of summer! Tonight – Join us from 5:00 – 8:30 pm down at Lakeview Commons for a Volunteer Recruitment Party! We’ll be cooking up some free food for everyone that attends! That’s right, FREE FOOD! We’ll also be sharing all the juicy details on the upcoming lineup, new features of the concerts, and ways to get involved. 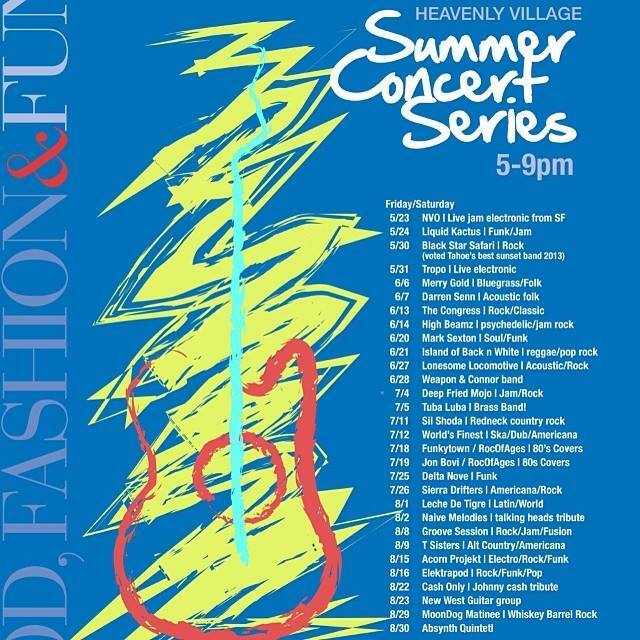 Friday 6/20 – The Heavenly Village Summer Concert Series continues with more FREE concerts! This Friday you can catch Live at Lakeview favorites, The Mark Sexton Band. This is also the final day to rack up some extra miles for the Tahoe Bike Challenge so take a nice long bike ride before the live music kicks off at 5:00 pm. Saturday 6/21 SUMMER SOLSTICE! – Celebrate the longest day of the year by exploring the outdoors! Go for a hike to see the wild flowers or one of the hundreds of beautiful lakes in the Tahoe Basin! 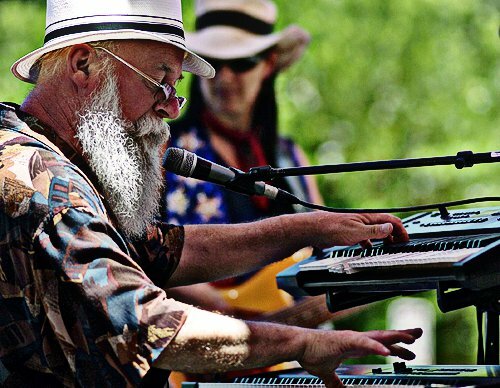 End this extra long day with more FREE live music at The Heavenly Village Summer Concert Series and you’ll get to enjoy another Live at Lakeview veteran, Island of Black & White! Sunday Funday 6/22 – Local hot spot, Steamers Bar & Grill, is helping you cure your Summer Solstice hangover with a Bloody Mary contest from 12:00 – 4:00 pm. PLUS you can catch another round of live music from the last band to take the Live at Lakeview stage, Arden Park Roots! Monday 6/23 – With temps expected to reach the 80’s today, I strongly recommend spending Monday at the beach working on that summer tan! Bring a few friends, some sunscreen, and you’re set for a perfect Tahoe day! Tuesday 6/24 – The Harvey’s Outdoor Concerts kick off Tuesday with Sarah Mclaughlin. This multi-platinum, grammy award winning superstar will start her show at 8:00 pm so get there early if you plan to tailgate! 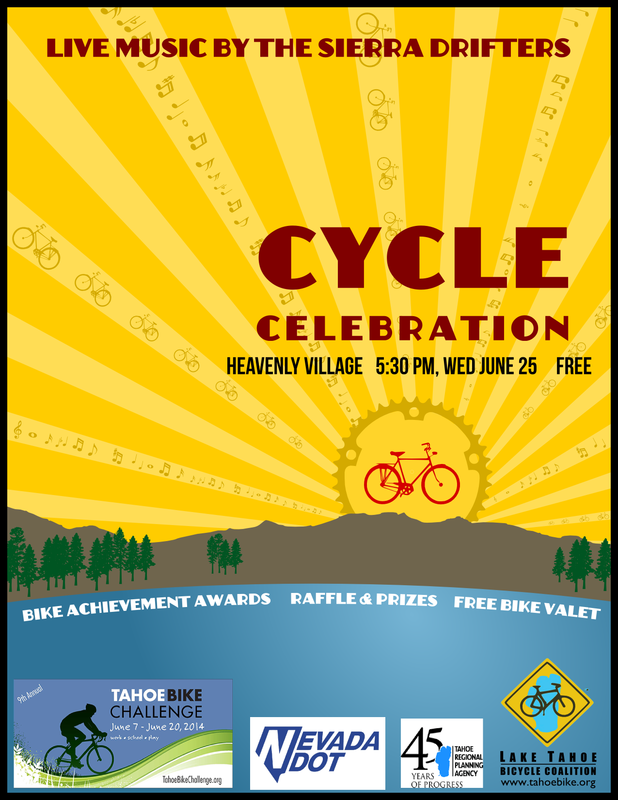 Wednesday 6/25 – The inaugural Cycle Celebration is going down at the Heavenly Village from 5:30 – 7:30 pm to celebrate all the participants of the 9th Annual Tahoe Bike Challenge! FREE live music with The Sierra Drifters, awards, giveaways, and lots of fun is in store at this totally free event! THURSDAY 6/26 – The wait is over!!! Live at Lakeview returns to Lakeview Commons in South Lake Tahoe with Peter Joseph Burtt & The Kindtide w/ special guests Liquid Kactus! As usual, the show runs from 4:30 – 8:30 pm! Parking is super limited this season with all the construction around Harrison Avenue so utilize the FREE parking at the South Lake Tahoe Recreation Center (1180 Rufus Allen Blvd) or ride your bike to take advantage of the FREE Bike Valet! See you soon Live at Lakeview fans! 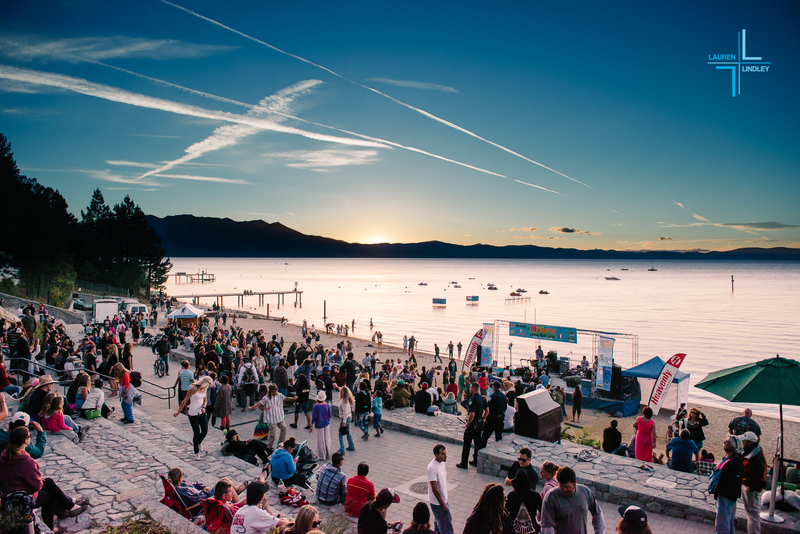 Free Concerts Return to South Lake Tahoe! It’s the last Thursday of Spring! You know what that means, right?! 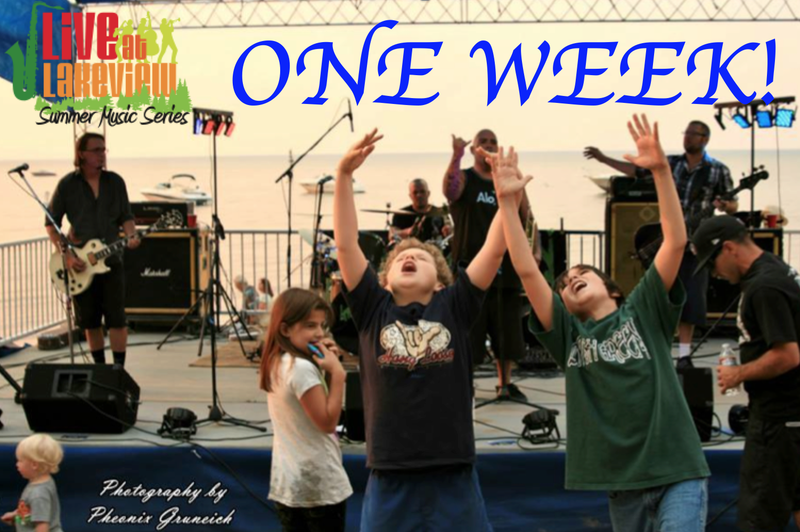 FREE summer concerts return to El Dorado Beach in South Lake Tahoe in ONE WEEK!